Did you know: The largest national park, Yellowstone is larger than Rhode Island and Delaware combined. Yellowstone is so large that it resides in three different states. More than 2,000 natural arches- the result of wind and water erosion against sandstone landscapes- adorn Arches National Park. Truly breathtaking at both sunrise and sunset, these natural arches are dreamlike in their majesty, with the red and tan sandstone weathered into the most unusual shapes. The arid desert environment and blazing heat make this park largely void of vegetation along and around the sandstone cliffs- but the rock sculptures more than compensate for the sparse vegetation. Truly a photographer's playground, Arches National Park is worth a visit for any outdoorsman, hiker and nature lover. How To Get There: From Moab, Utah, take U.S. Rte. 191 North five miles to the park entrance. Suggestion: Avoid going in July and August as temperatures can easily reach 100 degrees Fahrenheit; wear light clothing, sunscreen and hiking boots. "Everything in Texas is BIG" and "Don't mess with Texas" are two slogans you'll hear from people who have visited and lived in the Lone Star state. The Rio Grand River forms the boundary of Big Bend National Park, which lies along the U.S.- Mexican border. The park encompasses over 800,000 acres and supports a remarkable variety of plant and animal life; more species of birds (over 450) have been spotted here than in any other U.S. National Park. Although intensely rugged and remote, Big Bend has a desolate beauty which lovers of the Southwest will enjoy. A geologist's and naturalist's dream- with the Chisos Mountains, Santa Elena Canyon, Panther Pass, Tornilla Flat and the Lost Mine Trail all taking you to pristine hiking and backpacking areas with scenic overlooks. Many question the importance and the natural beauty of the U.S. Southwest- but one trip through Big Bend will show any ardent nature lover that the desert and arid mountains can an hold enormous treasure chest of scenic delights. How To Get There: From Marathon, Texas, take U.S. Rte. 385 South to the northern entrance of the park; Texas Rte. 118 from Alpine leads to the western entrance. Suggestion: Avoid going in mid-Summer, as the temperatures can easily reach 100 degrees Fahrenheit; dress lightly, but bring a light jacket in Fall/Winter; wear sunscreen all other times; bring hiking gear and boots at all times. 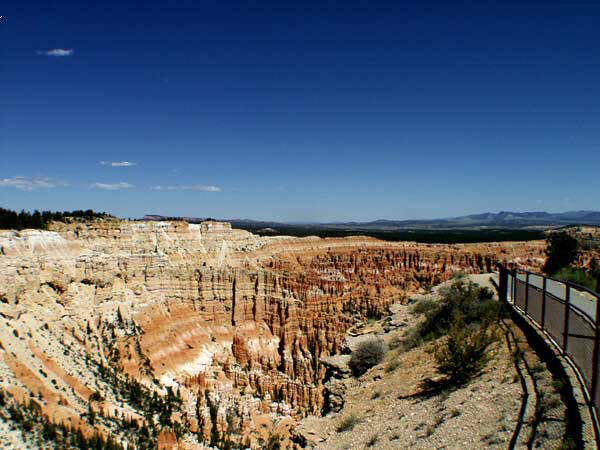 The most intensely beautiful natural landscapes formed by erosion of multi-colored sandstone in the U.S. await the visitor to Bryce Canyon National Park, which is almost surreal in its splendor. Travelers often remark that they didn't think such natural beauty existed on Earth- and the 35,835 acres here exhibit scenic wonders unavailable nywhere else. The unending process of wind and water erosion- along with the freezing and warming of rocks- has shaped this park into a dramatic showcase for the work of nature over eons of geologic time. How To Get There: From Zion National park (83 miles West), take Utah Rte. 9 East, then go North on Utah Rte. 89, continuing East on Utah Rte. 12 to Utah Rte. 63, the park entrance road. Established during the Truman administration and at the same time as Big Bend National Park, Carlsbad Caverns is a geological and photographer's wonderland. On the northern fringe of the Chihuahua Desert,, underneath the Guadalupe Mountains lies perhaps the largest, deepest and most ornate caverns ever discovered. A complex series of geologic events over millions of years led to the current surreal panorama of limestone stalactites (hanging downward) and stalagmites (pointing upward) present throughout the caverns. Scientists have explored more than 30 miles of passageways in the main cavern at Carlsbad- which lies 900 feet underground. Spelunkers will enjoy the "other worldly" feel to walking amidst an environment unlike anything seen above the ground. The caverns were discovered around the beginning of the 20th century by James Larkin White, a miner who regularly excavated the bat guano deposits for shipment to the citrus groves of southern California. Since then, scientists have delineated one of the most extensive and fascinating series of caves, underground scenic rooms and subterranean chambers in the world. How To Get There: Take U.S. Rte. 62/180 southwest from Carlsbad, New Mexico; the Visitor Center is seven miles West of Whites City. Suggestion: Hiking boots and related gear is recommended. Perhaps the most breathtaking single natural wonder in the U.S., the Grand Canyon is the result of a river that stuck to the job. The Colorado River ("color red") eroded through numerous rock formations over millions of years to expose 277 miles (1,904 square miles) of scenic landscape. Many photographs and posters over the years have this the most recognized symbol of America's natural beauty. 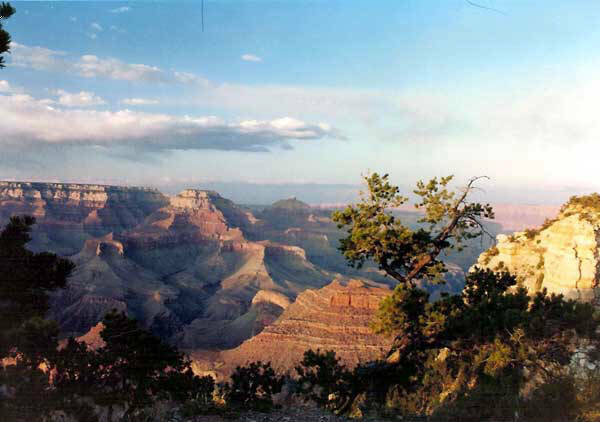 Approachable from both the South and North Rim, the Grand Canyon has numerous trails which take visitors to a wide variety of natural wonders. Two major trails- the Bright Angel and Kaibab Trail- offer hikers, backpackers and casual visitors the opportunity to stroll through some of the most beautiful landforms on Earth. When To Go: Best in Fall and Spring. How To Get There: South Rim- from Flagstaff, Arizona, take U.S. Rte. 180 or take U.S. Rte. 89 to Cameron, Arizona, then Arizona Rte. 64 to the Desert View entrance; North Rim- take Arizona Rte. 67 from Jacob Lake through the Kaibab National Forest to the North Rim entrance. Suggestion: Wear sunscreen and dress lightly in late Spring and Summer, with hiking boots mandatory if you plan to hike part or all of the canyon. 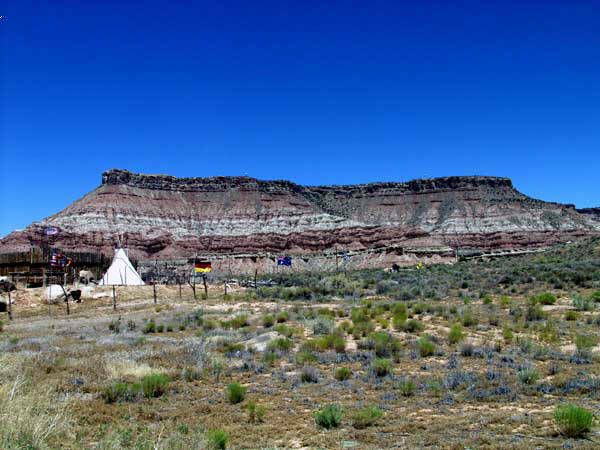 The Indians lived in North America well before Columbus arrived in 1492 and they- sometimes called Anasazi or "ancient ones"- migrated to the Southwest and dwelled in stone caves along an arid plateau which the Spanish named Mesa Verde ("green table"). Here archeologists have excavated more than 4,800 sites of dwellings dated from 550- 1,300 A.D. and their remains are truly awe-inspiring. This is a holy place- and some monuments called kevahs were ancestral worshipping and eating places (kitchens). The spectacular Cliff Palace, Long House, Oak Tree House and Petroglyph Point Trail are all remnants of a people who literally lived off the land and treated the Earth, sky and stars as sacred. How To Get There: From Cortez, Colorado take U.S. Rte. 160 East for eight miles to the park entrance, then follow the winding road for 15 miles to the Far View Visitor Center and another 5.5 miles to the main cliff dwellings. The only major U.S. National park spanning two countries, Waterton-Glacier (often called Glacier National Park) is among the most spectacular and scenic of the National parks- and thankfully, among the least known. Another World Heritage site, the 1,800 square miles of the park ontain what naturalist John Muir called "the best care-killing scenery on the continent". This park gets my vote for the best vistas and variety of landscapes of all those in the U.S. National park System. Some 650 lakes (including the famous Lake McDonald, photographed by Ansel Adams), dozens of glaciers and numerous waterfalls dot the landscape- along with over 1,800 plant species and 64 species of mammals, 275 bird species and- starting again in the 1980's- the first settlement of the gray wolf sighted since the 1950's. Elk, bighorn sheep and grizzly bears roam throughout this beautiful wonderland- and they sometimes take advantage of tourist handouts and leftover trash. Endangered habitats and corporate development of oil and gas leases, strip mining and logging are serious issues confronting the future stability of the park. In this region- where sheltered valleys and temperate weather have allowed inhabitants to exist off the land for almost 10,000 years- modern society now confronts the issue of preservation versus progress. With its superb vistas and unique topography, let's hope that Glacier National Park wins. How To Get There: Take U.S. Rte. 89 to the Saint Mary Visitor Center or U.S. Rte. 2 to the West Entrance. The world's first National park, Yellowstone is truly a wonderland of mountains, meadows, geysers, reflecting pools, lakes, rock formations and wildlife. Perhaps the widest assortment of unique and interesting landforms, animals and habitats within any of the U. S. National Parks, Yellowstone is best known for "Old Faithful"- the geyser which spurts every hour on a timetable so predictable that tour times are scheduled around it. The park is home to elk, bison, mule deer, bighorn sheep, grizzly and black bears, wolves, moose, mountain lions, beaver and many more species. Numerous roads and trails wind throughout the park, including Grand Loop Road and the Continental Divide National Scenic Trail. Families will enjoy the assortment of natural landscapes which inspire both young and old.How To Get There: There are five entrances to the park- from the East, take U.S. Rte. 14/16/20 from Cody, Wyoming and from the South, go from Flagg Ranch, North of the Grand Tetons. Suggestion: Avoid the mid-Summer crowds, which can be overwhelming. Made famous by the superb black and white photographs of Ansel Adams, Yosemite is among the most revered of the U.S. National parks for its spectacular beauty and variety of landscapes. "No temple made with human hands can compare to Yosemite" wrote the famous naturalist John Muir, whose efforts led to the creation of the park. Valleys, domes, pinnacles, alpine meadows and rugged mountains offer superb hiking, backpacking, photographic opportunities and sightseeing to both the ardent naturalist and casual observer. This park- which is roughly the size of the state of Rhode Island- is a United Nations World Heritage site. Within the five life zones/ecosystems live chipmunks, mule deer, marmots, pikas and rabbits along with dogwood, red fir, Jeffrey pine and dwarf willow. Numerous hiking trails allow for even the weekend visitor to enjoy the natural splendor of one of America's most beloved parks. When To Go: All year round, but best in late Summer/early Fall. How To Get There: From Merced, California, take California Rte. 140 to the Arch Rock entrance. Suggestion: Due to its fame, Yosemite can be quite crowded in June and July- avoid the Fourth of July. Like Bryce Canyon National Park, Zion is a natural showcase of the gems unearthed due to wind and water erosion over millions of years. The Virgin River carved its way through numerous rock formations to expose huge gorges, hanging valleys and multi-colored sandstone cliffs. Features such as Pine Creek Canyon, the Great Arch, Zion Canyon Scenic Drive and the Court of the Patriarchs are "must see" spots for any visitor. The Emerald Pools, Weeping Rock and Great White Throne will enchant both hikers and casual weekend explorers. How To Get There: From Cedar City, Utah to the Kolob Canyons Entrance, take I-15 about 18 miles South. To Zion Canyon, take I-15 to Utah Rte. 17, then take Utah Rte. 9 to the South Entrance (about 60 miles). Suggestion: Wear sunscreen and hiking boots/attire.